Compared with traditional CCFL backlit LCD monitors, ViewSonic’s VX2250wm-LED features a mercury free LED backlight 22” (21.5” Vis) widescreen display with up to 40% energy savings. The VX2250wm-LED delivers Full HD 1920×1080 resolution, 5ms response time, an incredible 10,000,000:1 MEGA Dynamic Contrast Ratio, digital and analog inputs and integrated stereo speakers. With its piano black finish, this ViewSonic VX2250WM-LED is an elegant fit to any décor, no matter for home or office. It can be mounted on a VESA compliant stand or wall mount bracket. Featuring mercury free backlight and low energy consumption, the Energy Star 5.0 certified VX2250wm-LED in not only environmentally friendly but also friendly on your electricity bill. VX2250wm-LED is able to dim the backlight completely for pure darkness during dark scenes such as a night shot in a movie. Each LED has the ability to completely shut off allowing for a near infinite ratio of black to white contrast thanks to the LED backlight. 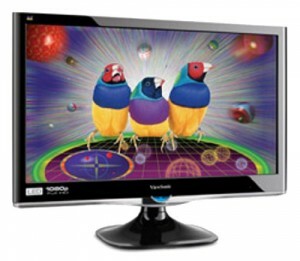 The VX2250wm-LED monitor also comes with diverse connectivity options, making it flexible to be paired with a PC or a Mac computer. You can hook up a Viewsonic ViewBook notebook or a PC Mini as well as a MacBook or a Mac Mini to the VX2250wm-LED and enjoy a full 22″ (21.5″ Vis) widescreen with LED backlight since ViewSonic has recently announced a full line of PC products, including notebooks, netbooks, PC Minis and all-in-one PCs.